A Turkish sugar factory workers union delivered nearly 1.7 million signatures Tuesday against the privatization of sugar factories to their parent trade union confederation, asking the government to reconsider the issue and change the terms of the deal. 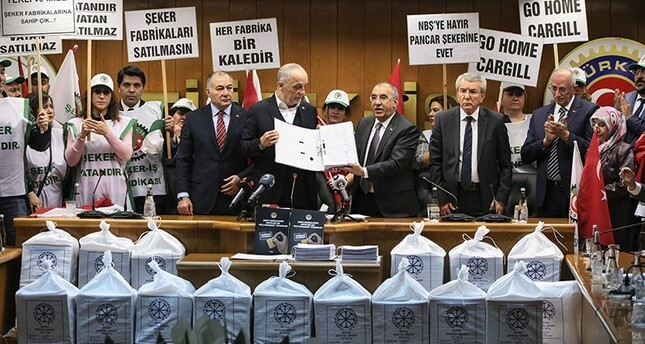 The executives of Food and Sugar Industry Workers Union of Turkey (Şeker-İş) delivered the files containing 1.69 million signatures to Confederation of Turkish Trade Unions (Türk-İş) Chairman Ergün Atalay in sugar sacks, aiming to be delivered to government officials in talks prior to the privatization process. Atalay, who runs the country's largest trade union in terms of membership, stated that this is the highest number of signatures gathered for a cause during his entire unionist career. "We gave the struggle we are giving today in 2006 and achieved results. The privatization again came to the agenda in 2011 and 2012, and we achieved results again. Now we continue our struggle with this signature campaign," Atalay said. He noted that there are 33 sugar factories operating in Turkey, with 25 owned by the state, five run by producer cooperatives and three owned privately. In addition to maintaining jobs for the approximately 10,000 people working in public-owned sugar factories, Atalay said the union's efforts to keep these factories running is based on their importance in public health. Only five of 14 factories within the scope of privatization will continue to operate due to the limited capacity of sugar beet cultivation in areas where the other nine factories are located, Atalay said, adding that it won't be surprising if the starch-based sugar lobby moves to acquire these five factories. He underlined that they favor a model in which farmer and worker cooperatives operate these factories with government supervision. Atalay added that the union was pleased that the government moved to reduce the starch-based sugar quota from 10 percent to 5 percent. The decision to privatize sugar factories, along with many other public enterprises, was taken in 2000 by the three-party coalition in order to secure funding from the International Monetary Fund (IMF), as Turkey was trying restructure its economy amid high political instability and two major earthquakes in 1999. Shortly after, in February 2001, the country's economy crashed in the largest financial meltdown in its history, and loans from the IMF and the World Bank conditioning liberalization policies became the only option to keep the economy and the state running. After 2002, the Justice and Development Party (AK Party) governments stuck to these programs, which gradually helped the Turkish economy recover rapidly amid a politically stable environment, and carried out various privatization moves that helped fund various government programs. However, the privatization of sugar factories remains a contentious issue. Due to decades of wars and food shortages that crippled the nation in late 19th and early 20th centuries, establishing sugar factories was among initial industrialization efforts of the young Turkish republic. They remain among the oldest enterprises that are still in operation, leading many to feel they have foundational significance to the nation. Opponents of the move to privatize the industry state that sugar is of critical importance for public health, and the sector should be tightly monitored by the government. The fate of factory workers and sugar beet farmers, which have been significantly subsidized, are also in question. Almost all opposition parties ----- including the center-left main opposition Republican People's Party (CHP) that traditionally supports a greater government role in economy, and the right-wing Nationalist Movement Party (MHP) that has closely cooperated with the AK Party in recent months -- remain opposed to the move. On the other hand, proponents of privatization state that the private sector could operate the factories more profitably, and that sugar production from sugar beets, which requires significant amounts of water in a country with limited resources, is not viable at its current state.